Shin splints is the name given to describe pain around the tibia (shin bone) on the front of the lower leg and can be used to describe several injuries in this region. This description of shin splints is based on inflammation of the tibial periostium (the sheath surrounding the shin bone) which is one of the most common causes of pain. 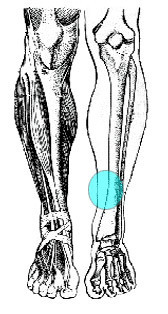 Pain over the inside of the shin, more commonly over the lower half of the tibia. Pain is often reproduced on palpation. Pain on pointing the foot or toes downwards. A redness and swelling may be evident over the inside of the shin. Lumps and bumps may be felt on palpation of the shin. Pain is present at the beginning of a run and then eases. This may then return after exercise or the following day. As the injury progresses pain persists longer before easing. If pain is aggravated by exercise a stress fracture should be considered. Tightness of the calf muscles. Excessive running on hard surfaces. A significant increase in training load or intensity. Running on toes or sports that involve a lot of jumping. Rest from training if pain is severe or decrease training load and intensity significantly. Use ice wrapped in a damp cloth and applied to the shin area for 10-15 mins regularly. Take non-steroidal anti-inflammatory drugs (eg. Ibuprofen). Consult your pharmacist / General Practitioner for advise / dosage. Ensure correct shoes — use gait analysis if necessary. Massage therapy of the calf muscles focusing on the inside of the shin but avoiding the bone. Stretch out the calf muscles regularly as described below. Stand with one leg in front of the other and hands against a wall. Make sure both feet are pointing forwards and that your heels remain on the floor. Lean in to the wall until you feel a stretch down the back of your calf. Hold for 30 secs. Stand with one foot in front of the other and the toes of the front foot against a wall. Bend your front knee until it touches the wall. Hold for 30 secs. If this is too easy and you do not feel a stretch make it more difficult by gradually moving the front foot away from the wall so you have to bend the knee further. This should increase the stretch. Once pain has decreased avoid reoccurrence by ensuring footwear remains correct, running on soft surfaces and increasing training load and intensity gradually. You should also start a strengthening programme to include heel raises and strengthening exercises with an exercise band.